Thankyou Tayna, Battery arrived in perfect condition , excellently packaged . Immediate and helpful response to my telephone call. Delivered the next day! Fantastic service. Only criticism - had to call to find out if acid was included, could this be added to product info on the website. Arrived promptly and well packaged. Easy to fill, no mess and plenty of acid. On the bike and in use in less than an hour. Ordered late on wednesday. Dispatched following day. Delivered pm friday. Well packed and protected with sealed seondary packaging. Delivered next day, fitted perfectly. Came with acid and very simple and effective filling system. Great product which they price matched and delivered promptly. I've used tanya a number of times now and can't recommend them highly enough. Ordered 13.00 received my order before 12.00 the nexted day. Fantastic service. Usual prompt service from Tayna. I've not fitted the battery yet but all appears just as it should. Excellent battery, shipped promptly. Rated with higher starting output than most other batteries of the same fitment, I chose this as the Ducati requires a bit of a kick to get it going. 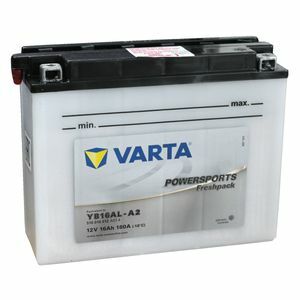 Easy to use website, battery received quickly and well packaged. Brilliant battery that has made a real difference.